“The kingdom of Goredd: a world where humans and dragons share life with an uneasy balance, and those few who are both human and dragon must hide the truth. Seraphina is one of these, part girl, part dragon, who is reluctantly drawn into the politics of her world. When war breaks out between the dragons and humans, she must travel the lands to find those like herself—for she has an inexplicable connection to all of them, and together they will be able to fight the dragons in powerful, magical ways. After several long years, the eagerly awaited sequel to Seraphina has finally arrived! I loved Seraphina, so I certainly had high expectations for Shadow Scale. Although I didn’t enjoy it as much as the first book, this sequel was nevertheless a worthwhile read! Besides Rachel Hartman’s amazing writing style, my favorite aspect of this book is the meticulous attention to detail regarding everything in Seraphina’s fantasy world. Each kingdom has different languages, cultures, and customs that are explained in the story with surprising clarity and ease. I don’t know how the author was able to keep them all straight in her head! The politics of the kingdoms are also quite complicated, as are the backgrounds and personalities of the characters. It’s always apparent when an author really pours their effort into fully fleshing out a fictional world, as is the case with this novel. Seraphina is a fantastic main character. Not only is she fascinating because of what she is- half dragon, half human!- but she is also a well-rounded, balanced female character. Often times girls are portrayed as either stone cold or soft and fragile, but Seraphina is strong, independent, and compassionate all at the same time. She isn’t afraid to show her emotional side, but she also understands when it is necessary to buckle down and be tough. She has her own interests and passions (primarily music) and although she does have a love interest, she doesn’t require his constant presence in order to function (unlike some female characters in YA fiction…). I really admire the multidimensional young woman that Rachel Hartman has created in this story, and I wish that there were more girls like her in YA fiction. Speaking of her love interest, I also really liked how romance isn’t an enormous part of this novel. Yes, it is certainly present- and thank goodness, because Prince Lucian is such a great guy!- but it is not really emphasized until the end of the novel when everything is coming to a close. The focus is largely on the action and adventure that Seraphina experiences, which is refreshing to read about in a genre plagued by a need for romantic relationships. Along with her romantic relationship with Prince Lucian, she also highly values her friendships with Glissenda, Abdo, and Orma. I could go on and on about all of the things I love about this sequel. Jannoula, the main antagonist, was so twisted! You almost sympathize for her because of her tragic past, but at the same time she’s so evil that you can’t really like her. She was such a dynamic, unpredictable character and she added an important element of suspense and drama to this story. Also, I really liked learning more about Seraphina’s mind garden, which reminded me a lot of Sherlock’s “mind palace” in the BBC TV series “Sherlock”. Watching it change over time was very intriguing, and it offered a unique look directly inside of the main character’s mind. My main complaint is that the first half of this novel had a rather slow pace. Until the twists and turns started happening, it seemed like the story was dragging quite a bit. After that, though, the plot really started to quicken and thicken (yay rhyming!) and I couldn’t put the book down. Moreover, I sort of had an issue with the ending of this book, particularly with what happens in the epilogue. I won’t spoil it, but it seemed out of character for Seraphina to just settle for something that she was so passionate about. Personally, I think she should have insisted that it turn out differently, even though what actually occurred did make some logical sense. She was such a strong character, and I really wanted to see her go after what she really wanted! However, I can see why it would realistically make sense for her to sit back and let things take their course. Overall, I really enjoyed this sequel even though it wasn’t as amazing as the first novel. I don’t know if there will be a third book in this series, but I really hope so! Would I recommend it to a friend? : Absolutely! I would definitely suggest reading the first book, though, because I think it would be really confusing if you started with this one. This is a great book for anyone who is interested in reading an excellent YA fantasy story that is thought-provoking, action-packed, and unique! 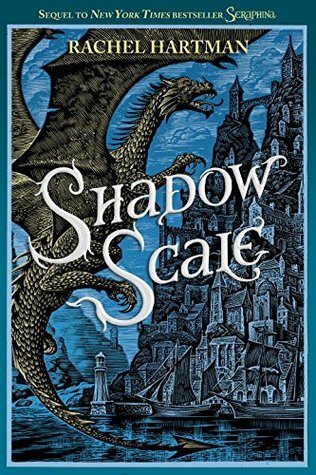 Have you read Seraphina or Shadow Scale? What are your thoughts on either or both of them? Let me know in the comments section below! Seraphina is on my TBR list! I love fantasy novels (and dragons) so I’m excited to start it! Yea, I wasn’t a big fan of the beginning either and I loved the romance between the characters and how Lucian tries to see her and spend time with her. That was sweet. I like that it wasn’t a major part of the story.